Written in the 1920s, Brumby Innes confronts the turbulent relations between the sexes and the races in the remote Pilbara region of Western Australia. It is published with another Prichard play from the 1920s, Bid Me To Love which, by contrast, is set among the fashionable rich in the lush hills outside Perth. The two plays are compelling for their dramatic styles and for their insight into the novels which followed: Coonardoo and Intimate Strangers. And both had to wait more than forty years for their first production. Katharine Susannah Prichard (1883–1969) was born in Levuka, Fiji, where her father was editor of the Fiji Times. She matriculated from South Melbourne College and worked briefly as a governess. She later taught in Melbourne, studying English literature at night. In 1908 she travelled to London, working as a freelance journalist for the Melbourne Heraldand, on her return, as the social editor of the Herald’s women’s page. In 1912 she again left for England to pursue a career as a writer and published two novels, The Pioneers (1915) and Windlestraws (1916). She met the Australian Victoria Cross winner, Captain Hugo Throssell while away and in 1919 married him, and moved to Western Australia. Already a committed Communist, in 1920, she was a founding member of the Communist Party of Australia. In 1922 her only son Ric Throssell was born. While she was on a trip to the Soviet Union in 1933 her husband committed suicide. From the 1920s until her death she lived at Greenmount, Western Australia, earning her living as a writer of novels, short stories and plays. Her novels include Black Opal, 1921; Working Bullocks, 1926; The Wild Oats of Han, 1928; Coonardoo, 1928; Haxby’s Circus, 1929; Intimate Strangers, 1939; and the goldfields trilogy The Roaring Nineties, 1946; Golden Miles, 1948; and Winged Seeds, 1950. 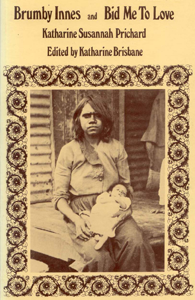 Prichard was a member of the Communist Party of Australia until her death, and her political concerns were reflected in most of her published work. Her novels were published throughout the world and translated into numerous languages. In 1951 she was nominated for the Nobel Prize for Literature. Additional AustLit information View the Austlit trail for Brumby Innes – a curated collection of additional resources specifically designed for Reading Australia.